Meditations are great for relaxing and reducing stress. Not only that, guided meditations can give you strong visual images and representations that you relate to, to create positive changes in your life. To get these visual images, we need to slow our minds down, get out of the busyness in our lives and turn inwards. This meditation is a simple yet powerful meditation to help you relax. Perfect for those who are new to meditation and those who find it difficult to relax in stressful times. Gentle, soothing and calming. It is a wonderful way to bring your awareness and drop into your body. A meditation to grow your self-love which is the foundation for strong boundaries. When used on a regular basis, this meditation reduces conflict in any relationship in your life, as your vibration shifts higher towards love. In a noisy high tech world, with so much information bombarding us, it can be difficult to find our true answer and to hear that inner voice, our intuition which is trying to guide us. This meditation will guide you to hear your intuition. Great for setting intentions and uncovering what is truly most important to you right now. Perfect for shifting your money vibe! Often our money story is stuck because of a lack of flow in our energy around money. Money is simply energy and we need often need to kick-start the flow around us. 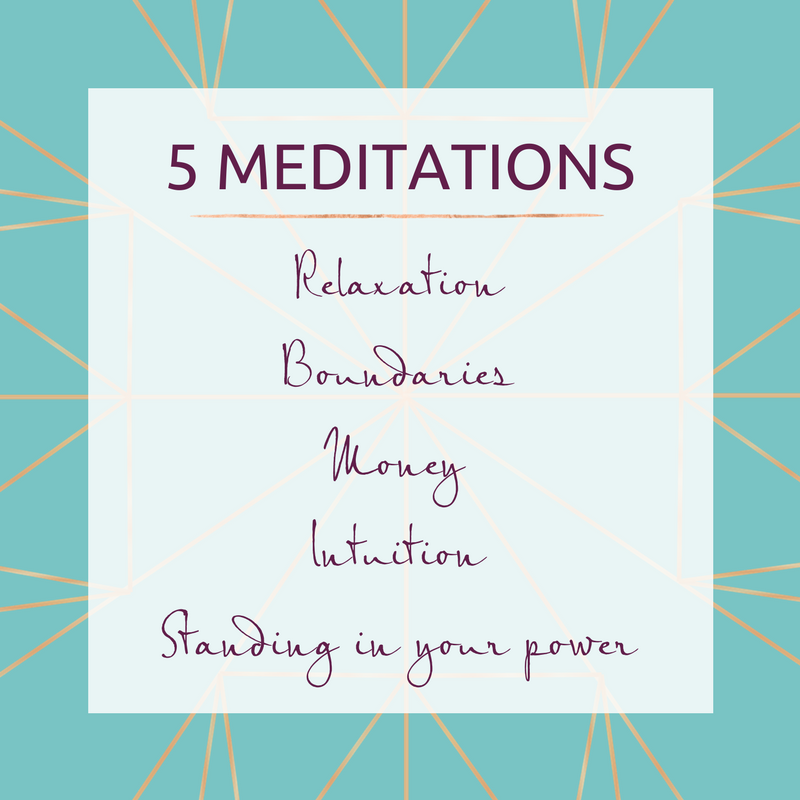 This meditation will guide you to create more ease and flow around money. Sabotage: the difference between what we know we should do and what we actually do! In this meditation you will see where your Inner Child is ruling the house and learn to step out of that energy and space. Through this guided meditation you will start calling on your adult or higher self, so that in more moments each day, you stand in your power.